This is the first in the series of posts, I intend to write on Deep Learning. This post is inspired by the Deep Learning Specialization by Prof Andrew Ng on Coursera and Neural Networks for Machine Learning by Prof Geoffrey Hinton also on Coursera. In this post I implement Logistic regression with a 2 layer Neural Network i.e. a Neural Network that just has an input layer and an output layer and with no hidden layer.I am certain that any self-respecting Deep Learning/Neural Network would consider a Neural Network without hidden layers as no Neural Network at all! To check on other classification algorithms, check my post Practical Machine Learning with R and Python – Part 2. Checkout my book ‘Deep Learning from first principles: Second Edition – In vectorized Python, R and Octave’. My book starts with the implementation of a simple 2-layer Neural Network and works its way to a generic L-Layer Deep Learning Network, with all the bells and whistles. The derivations have been discussed in detail. The code has been extensively commented and included in its entirety in the Appendix sections. My book is available on Amazon as paperback ($14.99) and in kindle version($9.99/Rs449). The cancer data set has 30 input features, and the target variable ‘output’ is either 0 or 1. Hence the sigmoid activation function will be used in the output layer for classification. At the input layer there are 30 features and the corresponding weights of these inputs which are initialized to small random values. In forward propagation cycle of the Neural Network the output Z and the output of activation function, the sigmoid function, is first computed. Then using the output ‘y’ for the given features, the ‘Loss’ is computed using equation (1) above. The backward propagation cycle determines how the ‘Loss’ is impacted for small variations from the previous layers upto the input layer. In other words, backward propagation computes the changes in the weights at the input layer, which will minimize the loss. Several cycles of gradient descent are performed in the path of steepest descent to find the local minima. In other words the set of weights and biases, at the input layer, which will result in the lowest loss is computed by gradient descent. The weights at the input layer are decreased by a parameter known as the ‘learning rate’. Too big a ‘learning rate’ can overshoot the local minima, and too small a ‘learning rate’ can take a long time to reach the local minima. This is done for ‘m’ training examples. The back propagation step requires the computation of and . In the case of regression it would be and where dE is the Mean Squared Error function. Note: It can be seen that the Accuracy on the training and test set is 90.37% and 89.51%. This is comparatively poorer than the 96% which the logistic regression of sklearn achieves! But this is mainly because of the absence of hidden layers which is the real power of neural networks. The Deep Learning journey has begun… Don’t miss the bus! Stay tuned for more interesting posts in Deep Learning!! Cloud computing does offer enterprises and organizations a mixed bag of goodies. For one it provides for a utility style computing, the ability to grow and shrink with changing loads, zero upfront costs etc. The benefits of cloud computing are many but does it all add up to profit for an enterprise? That is the critical question that needs to be answered. This post will take a look on what it takes for a cloud deployment to be profitable for an organization. The critical parameters for any web application are latency and throughput. A well designed web application whether it is an e-retail site or an ad serving application will try to minimize the latency or response time while at the same time maximizing the throughput of the application. For any application while the latency can be kept within specified limits the throughput will tend to plateau at a certain level and will not increase with increasing traffic. Utilizing a larger instance can improve the throughput plateau slightly. 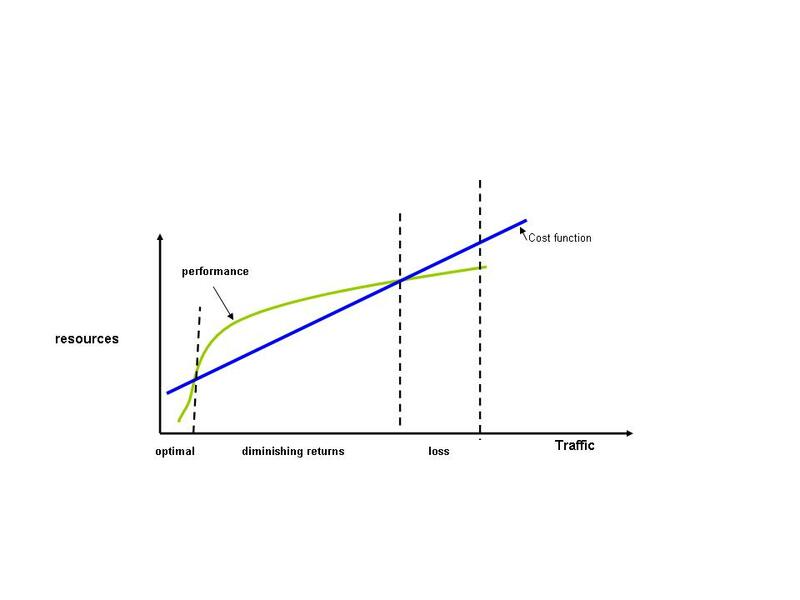 In any case the reality is that throughput tends to flatten as the traffic is increased. Where P = cost of DNS + Elastic IPs + other costs. Let us assume that for the cloud deployment we get a throughput of T.
In others words the revenue is proportional to the throughput. Hence to determine the profitability of a particular cloud deployment we need to compare the cost of the deployment for a given throughput versus a projected profit margin. As long the cost of the deployment is less than the revenue arising from the throughput, the deployment will be profitable. This can be represented pictorially as below. 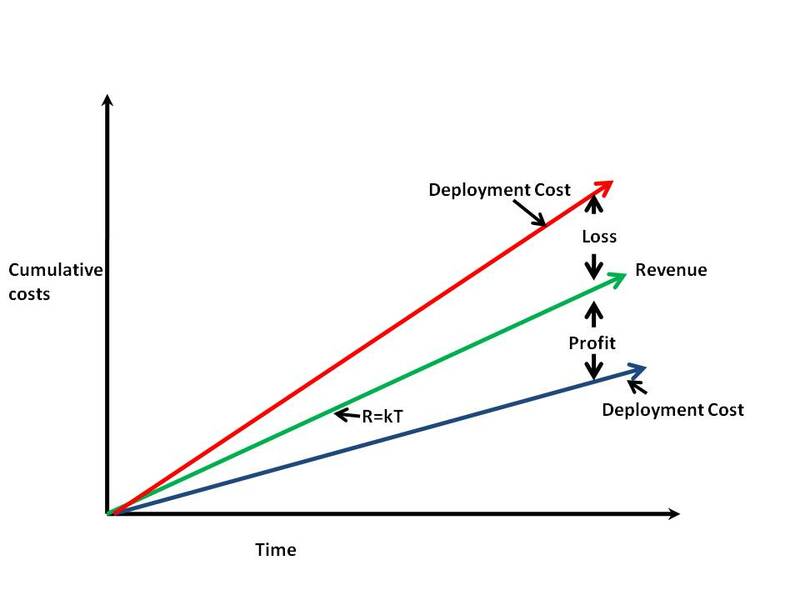 Hence as can seen from the picture as long as the slope of the cumulative deployment costs are less that the slope of the revenue the deployment will be profitable. The murmur of cloud computing today, is bound to build up to crescendo in the years to come, simply because it makes a sound business sense. Cloud computing is a new paradigm in the world of computing. The cloud essentially creates an illusion of infinite computing resources that are available on demand to the user who only pays based on the usage. While on the surface it appears extremely simple and straightforward, making an optimal use of the cloud is no trivial task. Prior to deploying on the cloud the enterprise has to decide the CPU, memory and bandwidth usage of the application. For e.g. the Amazon EC2 provides several variants of CPUs based on different pricing schemes namely $0.085/hr, $0.34/hr or $0.68/hr for small, large or extra large CPU instances. There are different pricing schemes for memory and bandwidth usage as well. While the technological challenge of deploying the cloud is a separate endeavor in itself, the business considerations needed for deciding the cloud computing resources, optimally, is a separate and an equally important endeavor. This article focuses on the business considerations needed for making an optimal choice of resources while deploying on the cloud. Since the enterprise is free to choose different CPUs which typically consists of CPU processors with different clock speeds or multi core CPUs for extra large instance the choice is really complicated. The designer needs to consider how his application scales up with respect to increasing, decreasing or burst demands in traffic. To estimate the kind of resources that would be needed would require a good understanding of how the application scales with respect to increasing traffic. 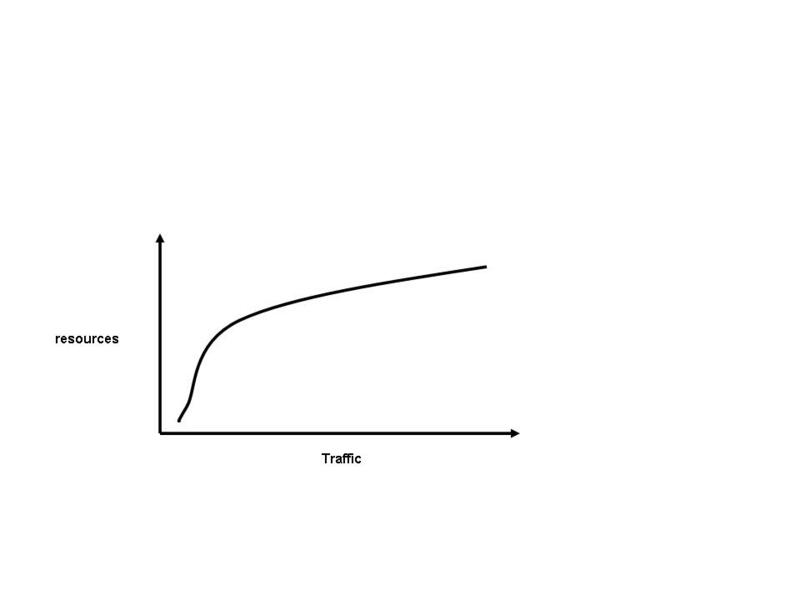 Ideally it will be remarkable if the application can scale linearly with increasing traffic. 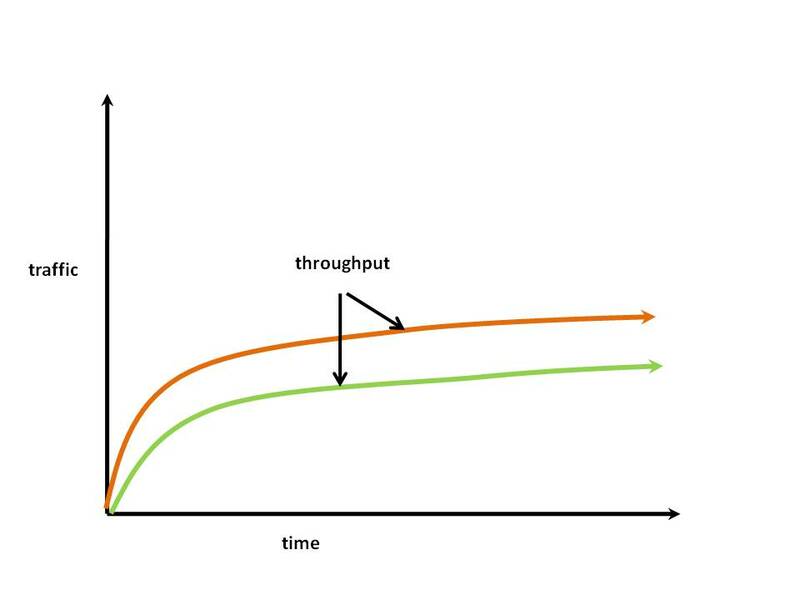 The key parameters that need to be considered for application performance is application latency and throughput versus the instance type. Also another consideration is to choose is the kind of resources types that need to be added. Ideally it would make more sense to add small CPU instances which can be added incrementally rather than adding extra large CPU instances which only handle part of the traffic. If we choose the large instance which is only partially used but has to be instantiated, nevertheless, to handle the extra traffic then it could result it wasting of precious resources. A prime consideration is the choice of CPU resource type and the need to understand how the CPU loads up with increasing traffic with respect to latency and throughput. 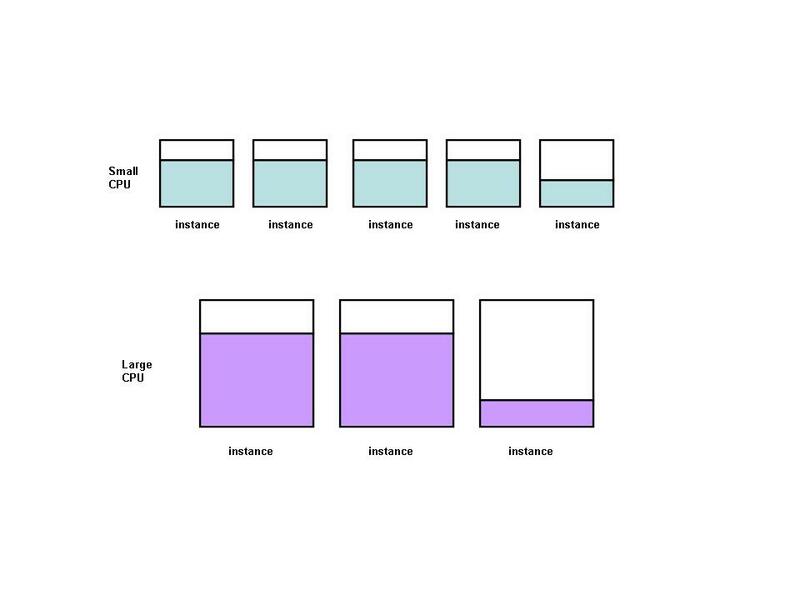 Once the CPU type, small, medium, large or extra large is chosen the designer needs to monitor how the loading of the CPU resource performs with increasing traffic. Window of Optimality: In the optimal window the cost of cloud computing resources, for handling the incoming traffic versus revenue for the enterprise is truly profitable. In the optimal window the application will be capable of scaling extremely well to increasing traffic thus resulting in excellent revenue for the enterprise. b) Window of Diminishing Returns: In this window the addition of extra resources at additional cost will not result in a proportional increase in scalability. In fact the increasing cost of adding additional resource will offset the revenue to the enterprise as the application will not scale appropriately and will result in diminishing returns. c) Window of Loss: This is the window, in which no enterprise should not find itself in. In this window the cost of adding the extra resources will be larger than the revenue to the enterprise as an inordinate amount of resources will have to be added for small incremental increase in scalability. This will be the result of a poorly designed application. In this situation the enterprise must go back to the drawing room and re-architect the application. Hence cloud computing, while truly alluring for the enterprise, it is a path that must be tread very carefully by the enterprise.